It takes a certain bold brilliance to compile a collection of shining indie rockers, top Hip-Hop artists and an impressive collection of House and Techno DJ’s on a Southside Chicago beach. However, organizers of Mamby on the Beach seized an opportunity to create this completely unique experience. Now, in its 4th year, Mamby continues to be one of the city’s most sought after boutique music festivals. Mamby’s location on Oakwood Beach provides lush grassy fields and a clean sprawling beach for attendees to roam. Go VIP and enjoy an experience like no other Chicago festival offers: water access. 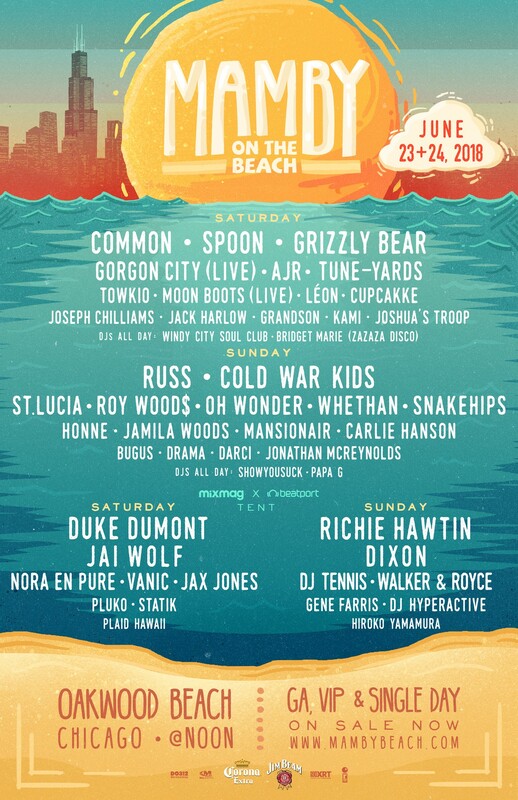 While VIP ticket holders will enjoy the industry standard express entry, preferred viewing and private bars, VIP will also grant you a special section of Lake Michigan to splash around in next to the main stage. After jumping in a few waves, head over to a brand-new VIP-specific Mamby addition: A VIP tiki bar. This area will include one-of-a-kind, custom built tiki lounges with shade and a cocktail bar. A truly overall one of a kind VIP experience. Knowing how to set the tune to a perfect summer beachside weekend is somewhat of an art. Mamby has perfected this art while staying true to its musical formula year after year. First, they take one-part brilliant indie rock in the vein of Spoon, Grizzly Bear, Cold War Kids and St. Lucia. Second, they add one-part Hip-Hop flavor with Russ, Roy Wood$, and hometown hero Common. Lastly, a healthy serving of top names in bumping electronic are added. Techno superstars Richie Hawtin and Dixon accompany House heavy-hitters Duke Dumont and Jai Wolf among others in the Mixmag/Beatport Tent. Take those three parts and bake them under a Chicago sun-laden skyline and you will end up with a truly utopic weekend. Since breaking ground, Mamby has listened to its patrons and has continued to upgrade the event every year. As a result, Mamby has grown into a well-rounded festival with many fun activities outside of the sound stages. One example is that attendees can partake in a few matches of beach volleyball while waiting for their favorite artist. The annual mid-fest water balloon fight is another example and is certain to bring overwhelming hints of nostalgia. Mamby continues to broaden its range of art installations and wellness workshops since its fruition. Yoga, tarot card and palm readings, poetry slams, henna tattoos, and local food options are all included with your general admission pass. Get to the festival early to partake in some of these awesome additions. Mamby has always attempted to give back to the community and city that has given the them such quick and widespread success. In years past, Mamby has donated to various nonprofit organizations and other progressive missions. This year they take it one step further by adding a brand-new Community Village. This special portion of the grounds will be dedicated to showcasing talent from Young Chicago Authors and other surrounding neighborhoods. Just another reason why Mamby has continued to gain prevalent credibility and respect. Chicago’s music community is mighty and has provided a plethora of young stars and prodigies in recent years. The amount of raw talent flowing from the busy city streets is undeniable. A hefty amount of local Rap and Hip-Hop will be represented this year with the unique lyricism of the Towkio, the relaxed avant-garde flow of Joseph Chilliams, the raunchy raps provided by Cupcakke and Chance the Rapper protégé, Kami of the Savemoney Crew. The Second City breeds much more than Hip-Hop lyricists. It has been known to create its share of singers and electronic up-and-comers. Don’t miss the soulful sounds of Jamila Woods and the widely respected gospel singer Jonathan McReynolds who will be providing a range of vocal feels. Behind the decks repping Chi-Town will be the young and tropical Whethan, Showyousuck, vinyl crate diggers Windy City Soul Club, and the dance club mainstay DJ Hyperactive. Mamby makes it a point every year to shine a light on the strong collection of local rappers, singers and musicians this Midwest mecca has to offer. For those looking for a fresh type of festival look no further than Mamby on the Beach this year. This unique two-day event boasts a lineup that feels exceptionally attuned to some of the hottest stars, rising locals and good vibes prevalent today. Visit the Bronzeville neighborhood this June 23rd and 24th for a fun environment geared toward community and wellness. Kick up some sand, splash in some waves and experience something different this year at Mamby on the Beach.